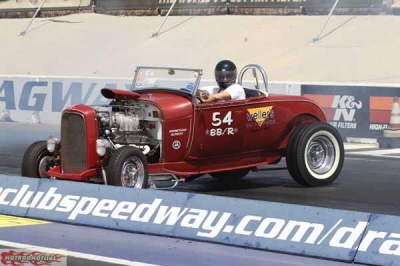 At the end of June I am going to be riding with the 59 Club up to Fontana to watch all the great Vintage Hot rods and motorcycles take a run up on the Quarter mile and this show is one of the best of the year, especially for a spectator as you get close to everything. But here you can even enter your machine if it fits into their requirements. This show has been going for years and i have not missed one, it is fun packed and always something new to see, a great time to also meet up with friends and chin wag about whats been going on etc. 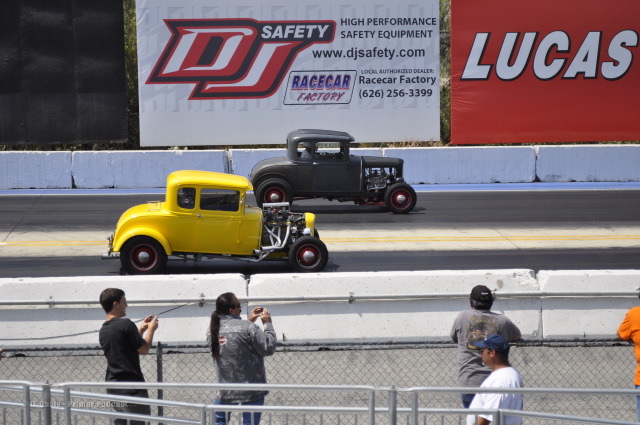 I know you will like watching Hot Rods line up and race, as well as gassers and some Vintage Model A’s with 4 Bangers, it sure is a treat. They may be slow by todays standards but great to watch and more hopped up than stock. The sound of the Flatheads, the smell of Race gas and the Camaraderie is second to none in this type of event. You never know what will be there ad for us to turn up in numbers will be a fun day for sure as there is plenty of places to park etc and is sure to be a brilliant day to watch the racing and to talk to like minded people. It is not to be missed just for the Nostalgia alone and I am looking forward to walking around the pitts and checking everything out there. Watching crazy built Altereds is amazing to see and hear as their Motors scream the 1/4 and smell the Nitro as they perge at the line. 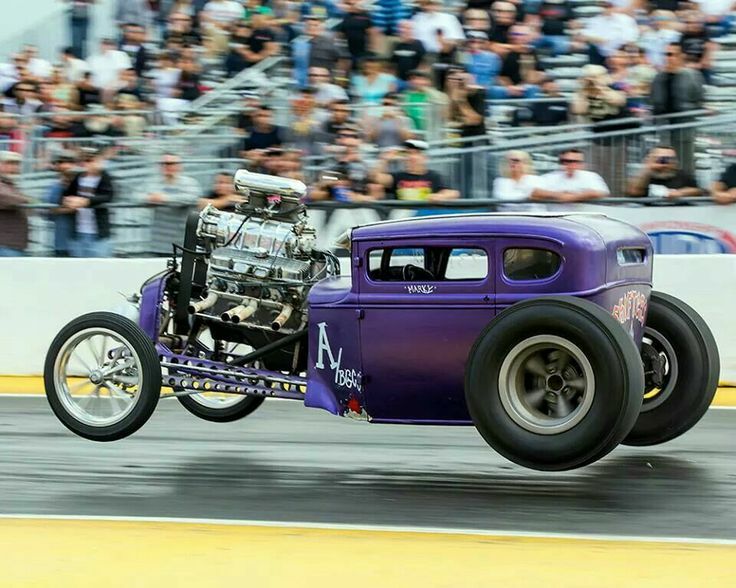 Marky from the Shifter ran his Purple people Eater and that was super to watch it launch off the line. I have known Marky 15 years and watched him create this when i was with them and at Anthony Castaneda’s shop back in the day and so great to watch this Altered Roar down the tarmac, spitting fume and fury all over the place, a fantastic show just for this ride alone. He flew off the line a couple of years ago and had everyone a gasp, but last year he had a solid run and it sounded like Thunder. Even watching fun old Whizzer style Push Bikes try for a 28 second pass is hilarious and I am sure you will agree? 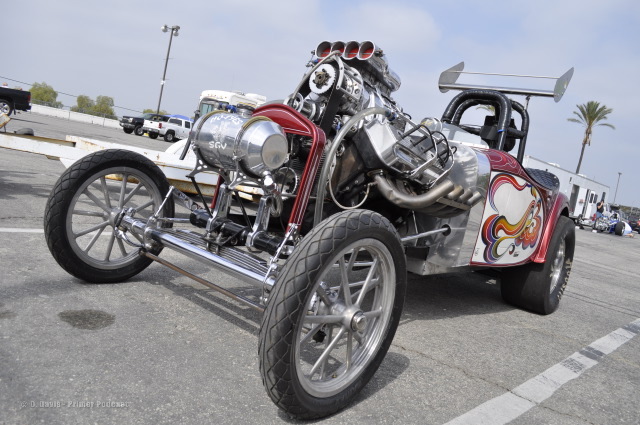 So if you like to watch Vintage racing at its very best, head on out to Fontana for the Antique nationals on the 28Th of June or ride out with us from Anaheim, you will thank us later after you have seen all that goes on there. You never know what you may see there, its different every event. So – Don’t miss the 45th running of the Antique Nationals – the original nostalgia drag race. 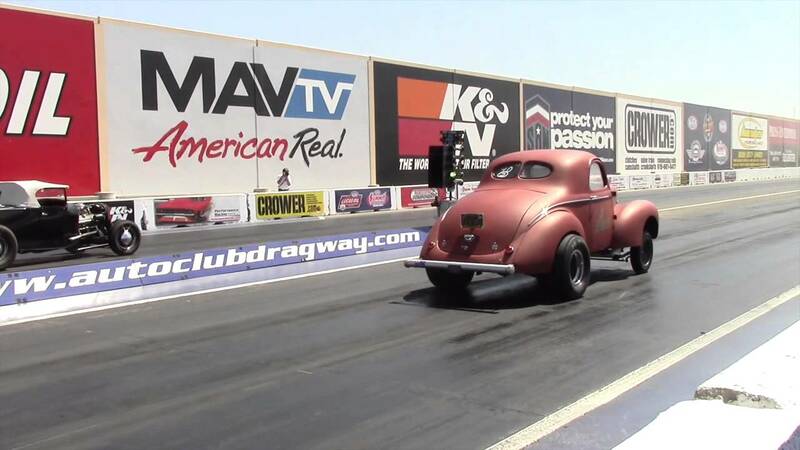 The Antique Nationals is the original nostalgia drag race. Racing is open to any 1954 or earlier type vehicle (Ford Trucks OK thru 1956). Race cars must pass tech inspection which requires seat belts and helmets in all cars. Open cars running 13.99 or quicker must have an NHRA approved roll bar/arm restraints. You can meet up with us at Aleas’ cafe in Anaheim and ride with us to the event, be great to see and meet you, my contact is 714-598-8392 or email me at carpy@carpyscaferacers.com and you can check it out on www.meetup.com and look for. We will be at Alea cafe in the Morning for the ride out, the 59 Club O.C. welcomes you all to ride with us. 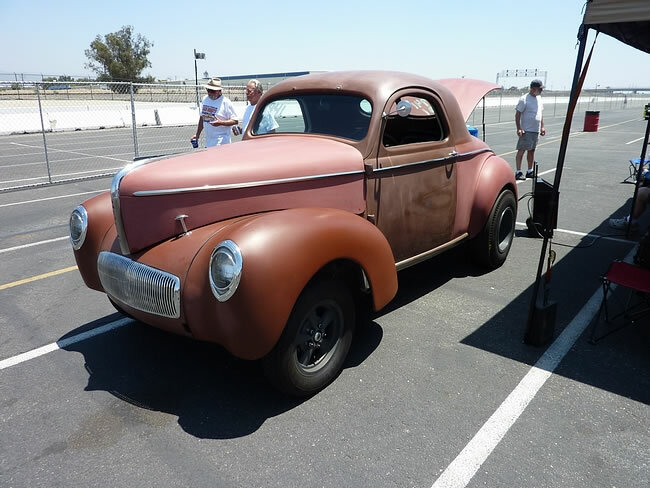 This entry was posted in Blog and tagged 1/4 mile, 29 ford, 32 ford, 59 club, ace cafe, antique nationals, autoclub raceway, av8, bobber, bonneville, brat, BSA. 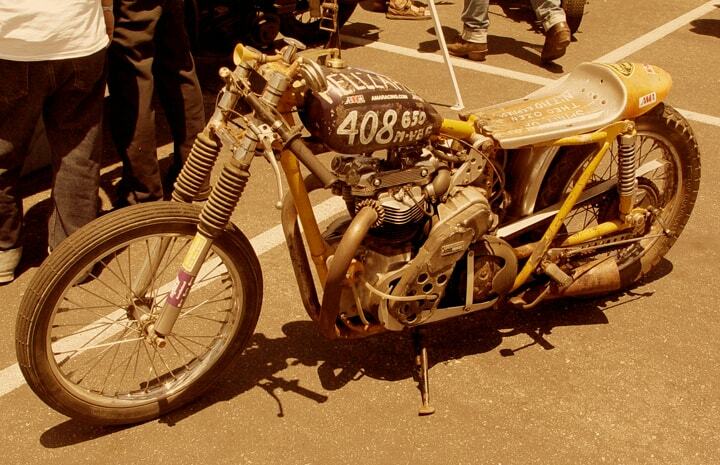 Matchless, cafe racer, chevy, chopper, classic motorcycle, custom, dodge, drag racing, Events, flathead, fontana, Gaser, Hot Rod drags, inline 6, Lucas Oil, meet up, nhra, plymouth, Rail, Roadster. coupe, slingshot, Studebaker, thruxton, ton up, triumph, tudor, vintage motorcycle. Some safety videos that now make me laugh. To My MUM, You will always be in my heart!